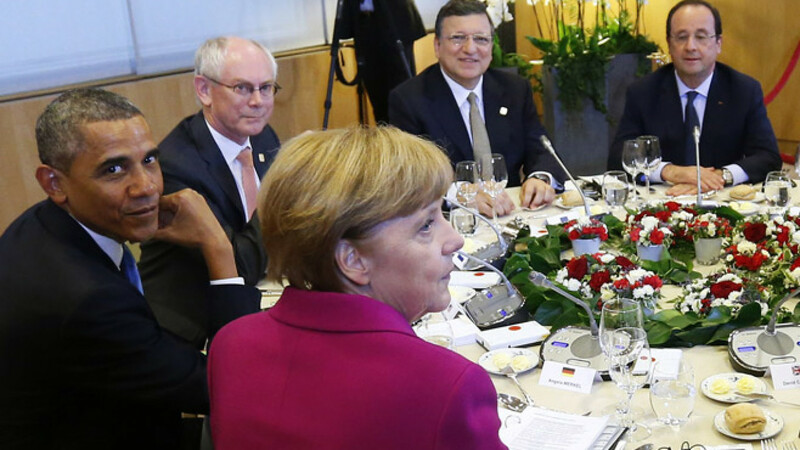 Leaders of the world’s industrialized nations are meeting without Russia for the first time in 17 years this week. BRUSSELS — The United States and its allies used the first Group of Seven meeting without Russia in 17 years to condemn Moscow's actions in Ukraine and threaten hard-hitting sanctions if President Vladimir Putin does not help restore stability. Meeting in Brussels rather than the Black Sea resort of Sochi — a snub to Russia, which was supposed to have hosted the Group of Eight — Western powers and Japan delivered strong rhetoric, even if the European Union's commitment to further sanctions remains in doubt. "We are united in condemning the Russian Federation's continuing violation of the sovereignty and territorial integrity of Ukraine," the United States, Germany, Japan, France, Britain, Italy and Canada said in a joint statement. "Russia's illegal annexation of Crimea, and actions to destabilize eastern Ukraine, are unacceptable and must stop." That message was reinforced by President Barack Obama, who said Russia's economy was already suffering and would only suffer more if Putin did not change behavior. "If Russia's provocations continue, it is clear from our discussions here that the G7 nations are ready to impose additional costs on Russia," he said. "Today, in contrast to a growing global economy, a sluggish Russian economy is even weaker because of the choices made by Russia's leadership." Putin, who will meet Germany's Angela Merkel, French President Francois Hollande and Britain's David Cameron on the sidelines of 70th anniversary of the D-Day landings in France on Friday, appeared unfazed by the threats. Asked at an event in St. Petersburg how he felt about being excluded from the G8 for the first time since joining the club in 1997, Putin was typically pointed, barely breaking stride to speak to Kremlin reporters as he left a meeting. "I would like to wish them bon appetit," he said, before walking away swiftly. It appears unlikely that Obama and Putin will talk in France. "Should we have the opportunity to talk, I will be repeating the same message that I have been delivering to him throughout this crisis," Obama said. With Putin not at the table, the G7 leaders chose to criticize Russia either by name or implicitly for its actions on several fronts, including Syria and energy policy. On Syria, the G7 "deplored" a decision by Russia and China to veto a draft United Nations Security Council resolution involving crimes committed by both sides in the conflict, and on energy policy it highlighted the problem of countries using energy as a weapon. "The use of energy supplies as a means of political coercion or as a threat to security is unacceptable," the statement said. 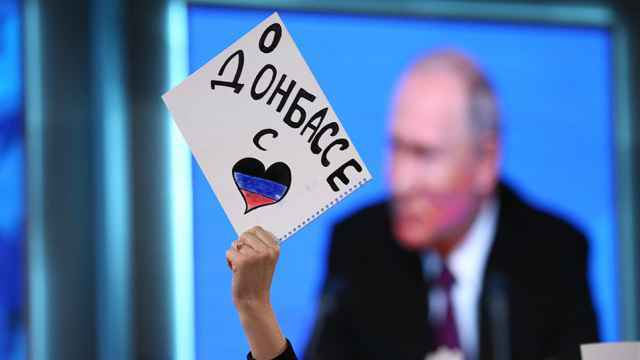 Since Russia supplies around a third of Europe's gas and oil needs and has threatened to cut off supplies to and through Ukraine if it does not settle outstanding bills, the reference was clearly directed at Moscow. Yet despite efforts to present a united front against Russia's seizure of Crimea and its tacit support for actions in eastern Ukraine, there remain chinks in the G7's armor when it comes to hitting where it hurts. France, which has come under pressure from the U.S. to cancel a contract to sell Russia two Mistral warships, appeared to win the argument, with Obama acknowledging that the deal would probably go ahead despite his objections. Merkel also gave Hollande support, saying that since the EU was not yet ready to impose tougher economic sanctions against Russia, there was no reason for France to cancel contract. Japan, which geopolitically has less interest in Ukraine, struck a conciliatory note, saying dialogue with Russia remained the best approach. "I want Russia to be involved in various issues concerning the international community in a constructive manner," Japanese Prime Minister Shinzo Abe said. "That is what the world desires too. To this end I am hoping to continue dialogue with President Putin." EU leaders said they would closely monitor Russia's actions over the coming weeks and take a decision at a summit at the end of June on whether there was a need for further measures. "Should events so require, we stand ready to intensify targeted sanctions and to consider additional measures," said European Council President Herman Van Rompuy, who chairs EU summits and coordinates the position of EU member states. "The European Council will assess the situation at the end of June. The day after tomorrow in France individual G7 leaders will convey this message to President Putin."